Cimbalom Pupils: New choir members start in the cimbalom pupils class where they follow the method Een Leven Lang Zingen (A lifetime of singing). This method includes playing a cimbalom, general music education and singing lessons. Training choir: After the cimbalom pupils class, the girls continue on to the training choir, where they learn to sing in a choral environment and gain their first concert experiences. Probationer: For their next step, the girls are assimilated into the concert choir. After an intensive vocal training, they can then audition for the concert choir. Concert choir: As a member of this choir, you sing all concerts and evensongs. 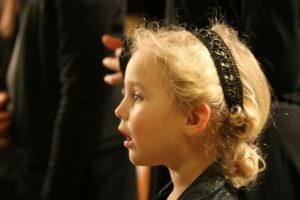 Roden Girl Voices: The most experienced choristers (soloists) can be invited for this part of the Choir, they sing mainly polyphonic a capella music.